You are here: Home » Hydrogen Internal Engine Cleaning » Diesel Engine Cleaning Clears Exhaust Gas Error Code! Diesel Engine Cleaning Clears Exhaust Gas Error Code! Diesel Engine Cleaning Made Easy with the KT 220! The diesel truck in the video above came to us with an EGR valve error code. Using the combined output of two KT 220 units to produce a total of 60 liters of hydrogen per minute, we were able to not only clean this diesel engine but also clear the error code while we were at it. For those of you not familiar, EGR stands for Exhaust Gas Recirculation. There is a valve on all modern engines that controls emission of nitrous oxide (NOx) gas which causes smog problems in cities around the world. A portion of the gas is re-routed from the exhaust back into the engine’s intake manifold. By adding this gas back into the combustion mixture, combustion temperatures are lowered below the 2500 degrees Fahrenheit. This is important because NOx gas begins to form when the temperature exceeds 2500 degrees. It is the EGR valve which controls how much of the exhaust gas is re-routed back to the engine. On this truck, carbon deposits had built up to a point where the valve was not functioning properly and the computer was noting the error. 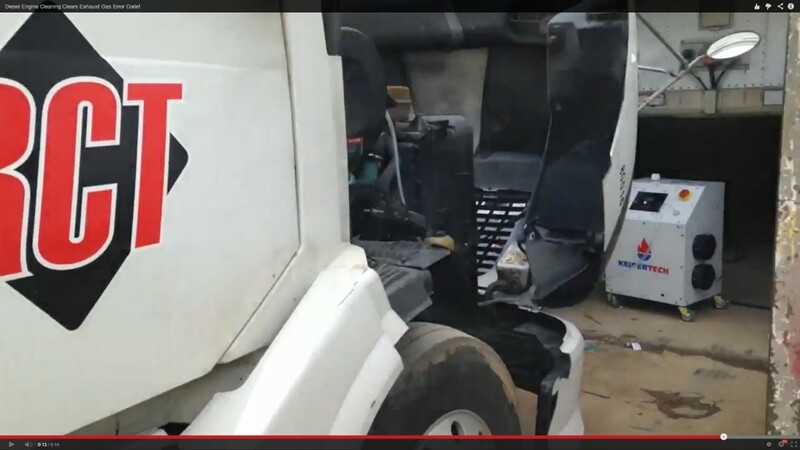 The combined output of two KT 220 units feeding 60 liters of hydrogen / oxygen gas mixture to the diesel engine burned up and removed enough of the deposits that the computer detected that the valve had begun to function properly! Needless to say we have one very happy owner!